We offer a wide selection of inlet sediment filters to fit nearly every size and shape of storm drain. Storm drain inlet protection is usually put in place, ahead of time, to prevent soil and debris from entering storm drain drop inlets. This is usually temporary and put into place before a site is ever disturbed. By excavating a small area around an inlet will create a settling pool that will remove sediments as water releases, slowly, into the inlet. This is done through small holes that are protected by gravel and filter fabric. Constructing barriers, made of a porous fabric, placed around an inlet entrance will create a shield from sediment while allowing water to flow into the drain. The barrier slows down runoff while capturing soil and other debris at the drain inlet entrance. Standard concrete block and gravel can be used to create a barrier against sediments while allowing water runoff to flow through certain selected blocks that are laid out sideways. 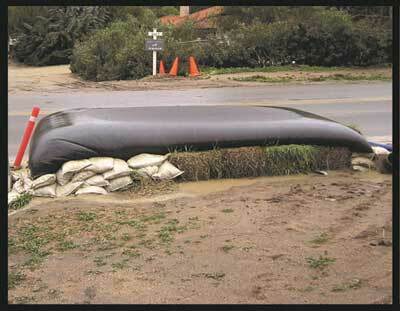 Sandbags can also be used to create a temporary barrier against sediment at the inlets. Sod can be installed as a permanent soltion to protect the inlet after the surrounding area has been stabilized. This will slow down storm water near the drop inlet entrance, while removing sediments and other pollutants from the runoff. In order to increase the effectiveness of these inlet protection sources, apply them with other measurements such as small confinements or sediment traps (USEPA, 1992). In all practicality, storm water drain protection alternatives, and various other measures, are good for areas where relatively clean runoff water is not heavily loaded with sediments. Steep slopes and large, exposed areas require the strongest sediment and erosion control. Although flatter slopes and smaller areas still require protection, less expensive materials would be more appropriate for those area. These systems allow soil particles to be held in suspension in order to “settle out” the storm water runoff. They are usually hydraulically controlled and slow down the velocity of runoff water. This allows for the accumulation of sediment particles by gravity. When designed correctly, sediment containment structures will provide large storage that's sufficient to handle all incoming water and allow for accumulation. Unfortunately, it's not always feasible to contain all runoff waters from a construction site because large containment areas and volumes would be required. Another reason, evaporation and infiltration might not be sufficient to drain the system before the next big storm comes. This, in turn, can cause flooding problems. Under these circumstances, sediment can be controlled by temporary Best Management Practices (BMPs) found on construction sites. This is a good alternative for contractors and is easy to use and inexpensive. Making sure pollutants stay out of curb inlets is an important responsibility for contractors. Correct drain protection will stop sediment, debris and oil from getting into inlets which could otherwise end up in streams, lakes, oceans and river ways. Not using curb inlet filters will cause damage to the environment and that's going to come out of the contractor's profits which can be devastating. There are stipulations within the Clean Water Act that include strict regulations directing construction site operators to provide legitimate drain protection requirements at all times. These requirements must be in place before any ground is disturbed all the way to the completion of the job. If these regulations are not met, enormous fines equaling in the thousands, if not millions, of dollars will take place as a result. Meeting these regulations is not difficult and are not expensive. Simple, affordable inlet protection products are available if you deal with the right company. You will get exactly what you need to protect the environment, while being compliant with the law, and implementing them in little to no time at all. 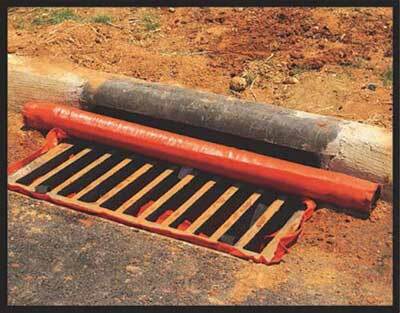 These rolls are used to protect inlets and do not have storm grates. They are made from a durable, porous material and the filters easily sit flush against a curb, directly in front of the inlet. This only allows water to slowly seep through the material. The sediment and debris carried in the water, that runs off the site, are caught by these rolls before entering the inlet. These top quality rolls offer a built-in protective overflow design for dependable performance, even in the heaviest of rains. They are specifically designed to conform to the shape of any curb, making it easy to get an impenetrable seal. Some offer the option for adding an oil absorbent filter to safely and securely take oil away from water as it passes through the roll. Maintenance of these quality curb inlet rolls is very simple. Remove all accumulated sediment and debris from the roll, and surrounding area, after each rainfall and it will be ready for use again. If you opt for oil absorbent filters, simply remove and replace them when they reach near saturation. 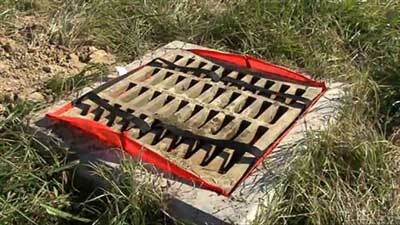 Inlet bags are constructed to be used with curb inlets that have storm grates. These products feature a bag that will encase the storm grate and a roll that sits against the curb. They provide a double-layer shield against sediment and debris. These premium quality curb inlet bags install in minutes, are designed to quickly conform to the shape of the curb for a sediment-resistant seal. There are various sizes to fit any curb and gutter inlet and some models have the option of adding an oil absorbent filter. Maintenance is as simple as sweeping debris and sediments away from them after it rains and then emptying the bags when accumulation occurs inside them. 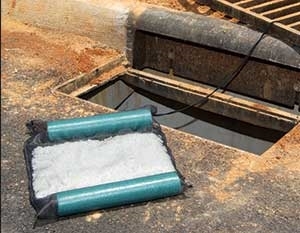 When used and maintained properly, curb inlet bags should last for a very long time and will reduce or totally eliminate the need to flush or clean the inlets. This will save contractors a great deal of money while remaining compliant with the law. This product is used with curb inlets that have storm grates. The sack has a curb roll on top and a sack that hangs below the inlet grate. As water runs into the grate, it enters the sack where it slowly filters through, trapping sediment and debris. 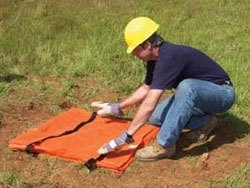 The open top design of the sack allows for easy visual inspection and compatibility with any size curb and gutter inlet. The roll will conform to any shape curb and offers an optional oil absorbent filter. 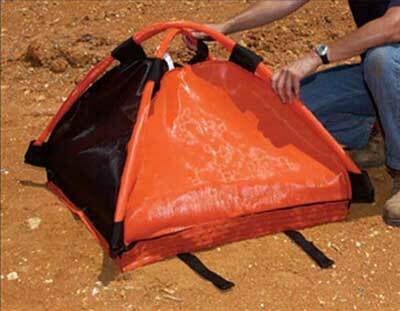 This allows the curb inlet sack to perform an important double duty. Are they reusable and do they have the option of oil absorbent filters to handle two jobs at once? Always make sure you deal with a reputable company that knows the Clear Water Act Laws and only sells regulatory-compliant units. They should also be able to answer any of your questions and be able to provide the products to you, quickly. By applying a little homework now, will save you time and money in the long run. This will free up your time to handle bigger tasks at hand. You must be able to protect the earth and your bottom line at the same time. Using Regulation Compliant Curb Inlet Filtration protection will make that happen. You will be doing the right thing in protecting the environment and getting the job done! 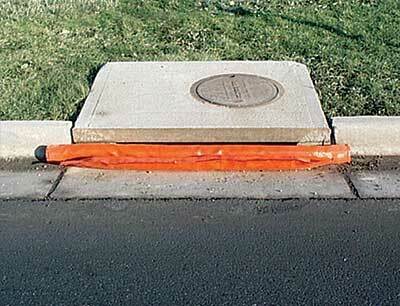 Correct curb drain / inlet protection will prevent sediment, chemicals and debris from entering storm water systems. This in turn will prevent these elements from entering into your streams, river ways, lakes and oceans. These pollutants are common on construction sites and when they are picked up in storm water runoff they are washed through curb inlets. If these inlets do not have proper filters and get through the system, they will cause irrefutable damage to the environment. Construction sites which emit unfiltered water can destroy aquatic habitats, kill wildlife and cause serious stream bank erosion. 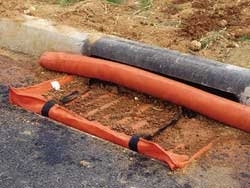 Sites that do not employ drain protection solutions will face massive fines. Failure to meet state and federal regulations, regarding drain protection, will cost developers and contractors thousands and millions of dollars in fines. As an example: In late August of 2009, a builder was fined more than half a million dollars for not having proper drain protection at their project sites in the Southeast and Midwest. Even though they are paying in installments, the interest is going to kill them. In North Dakota a real estate developer was fined $37,500 for allowing chemicals and concrete pollutants to wash into nearby storm drains. Both of these situations could have been prevented had they used regulation compliant storm drain protection products. Professional drain protection products stay in the guidelines of these laws to protect the construction sites and the environment. Contacting reputable companies will guide you to the correct solutions and they are only a phone call away! Products made for curb inlet filtration including rolls that are placed in front of curb inlets without storm grates; bags and sacks that are anchored below grates for storm grates are products that when professionally designed should conform to curb shapes, guard against pollutants and are also environmentally friendly. All these storm drain protection products should eliminate or at least reduce the need to flush or clean inlets. These products should be made of special materials that allow water to seep through, while trapping sediments and debris for safe disposal. When shopping around, compare all features, find out how each is installed, inspected and maintained. Easy to use, is a foremost factor for construction sites where time and money are involved. Ask your provider if these products are reusable as well. Only quality curb inlet protectors will be able to be cleaned, easily, and used over time and time again. Easy to clean and able to be used over and over again is a wise investment. Always make sure the curb inlet protectors are totally in compliant with current laws. This is paramount to protecting the environment and your business as well. You can make sure this is the case by only dealing with reputable inlet protection companies. These companies go out of their way to make sure their products live up to the laws and only manufacture products that are capable of doing so. Asking for guidance from these companies will save construction professionals many hours of research and the removal of unwanted headaches. Looking into the most recent regulatory standards and provisions for proper, lawful inlet protection should be done long before the ground is ever disturbed on the site. Detailed information and listings of all inlet protection requirements and other measurements for the prevention of storm water runoff pollution must be included in the construction company's Storm Water Pollution Protection Plan (SWPPP). The SWPPP is the prerequisite for getting a National Pollutant Discharge Elimination System (NPDES) construction storm water permit. This must be obtained before any work can begin. NPDES Permits are issued in the state where work is being done. There are a few states and most Indian territories where the Environmental Protection Agency (EPA) is the issuing authority. Information and details on SWPPP requirements can be found in the Stormwater Resource Locator, which is part of the Construction Industry Compliance Assistance Center's website. The EPA has published a Free Downloadable handbook that explains how to create and implement an SWPP. This handbook is entitled: Developing Your Stormwater Pollution Prevention Plan: A Guide for Construction Sites. The handbook includes two sample SWPPPs, a customization SWPPP template and a sample inspection form. Using these tools along with the right inlet protection company, will have you up and ready to break ground in no time at all. Getting compliant and staying compliant is not difficult to do, when you know where to go to get reputable help.